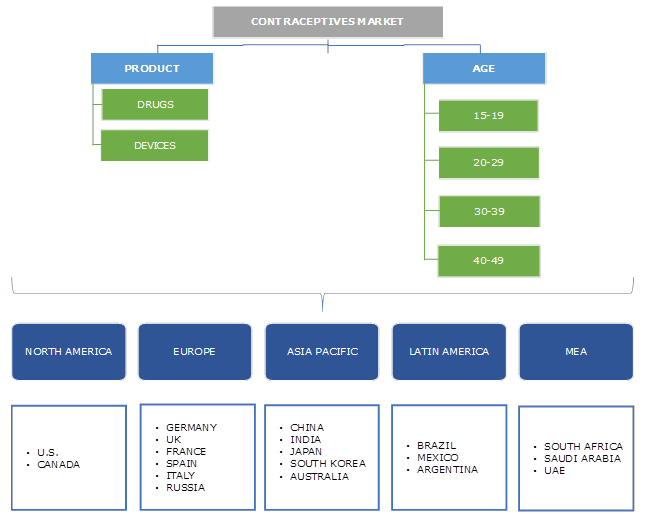 Contraceptives Market size was valued over USD 24,118.1 million in 2018 and is expected to witness 6.9% CAGR from 2019 to 2025. Rising government initiatives to promote awareness regarding unintended pregnancies and increasing population will create huge demand for contraceptives during the forecast period. Various programs aiming to meet the need for modern contraception and provide reproductive and sexual health services should involve a good participation of women, adolescents, and young people, at all stages of planning, implementation, and evaluation. An increasing number of women are postponing motherhood as they prioritize their careers. Moreover, balancing concerns of the cost for raising a child, ambiguity over job safety and unstable relationships are increasingly causing women to postpone pregnancy. In 2015, globally 64% of in-union or married women of fertile age were using some mode of contraception. Nevertheless, contraceptive use was much lesser in the under developed countries and was particularly low in Africa where only 33% of women are projected to use the products so far. High unmet needs in developing nation will fuel the market size. Demand for contraceptives would rise owing to rising numbers of new HIV infections in many countries over the coming years. Growing geriatric population across European nations coupled with rising incidence of lifestyle disorders will induce infertility eventually reducing the demand for contraception products. Moreover, concerns regarding the side effects of products can negatively impact the product demand in future. 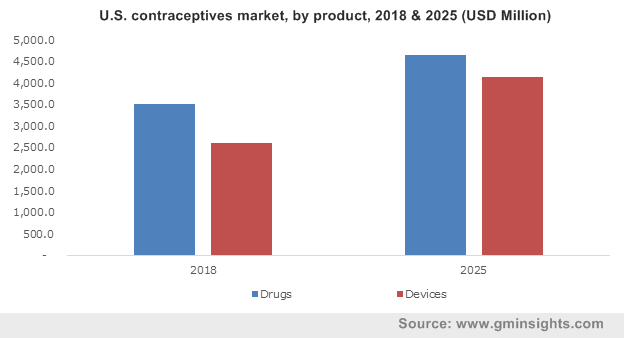 Contraceptive devices hold major market share and valued around USD 16,659.0 million in the year 2018. The growth is attributed to more effectiveness and long-term effect. The segment is rapidly adopted worldwide and will continue to grow during the forecast period. Some of the commonly used devices are condoms, diaphragms, sponges, rings, sub-dermal implants and intrauterine devices (IUD). Condoms are most popular choice worldwide and hold largest market share. Copper IUD is mainly preferred by the women who do not wish to use hormonal form to avoid possible side effects. Contraceptive drugs will witness robust growth at 4.8% over the projection period. The major reasons for the growth of the market will be rising prevalence of STDs and lack of family planning. Favourable regulatory scenario and awareness programs will strengthen segment growth. Various forms of drugs include hormonal oral pills, topical and injectable contraceptives. Oral pills market held major revenue share due to high consumption rate. Daily consumption of these pills facilitates acne reduction, reduces cramping during periods, and minimizes the risk of developing cervical & endometrial cancers powering the overall market growth. However, irregular bleeding, increased risk of developing sexually transmitted infections (STIs), nausea, and migraine are some of the disadvantages related with oral pills eventually hampering segment growth. The use of contraceptives in age group 20-29 will be high and valued around USD 8,505.6 million in the year 2018. As per the recent article, almost 50% of the pregnancies in the U.S. are unplanned and unwanted, and out of those around 42% end up in abortion. Hence, increase in number of teenage or early pregnancy will result in augmenting the demand and adoption rate of contraceptives, fueling the business growth in the forthcoming years. The use of contraceptives in age group 30-39 is estimated to witness significant growth at 7.2% over the forecast period. Increase in trend of delayed pregnancy among the women in the developing and developed economies will result in rise in use of contraceptives, enhancing the industry growth. U.S. dominated the North America contraceptives market and held major revenue share amounting around USD 6,116.5 million in the year 2018. The growth in contraceptives market was attributed to presence of sophisticated healthcare facilities, growing demand for contraceptives for preventing unwanted pregnancies, and favourable regulatory scenario. 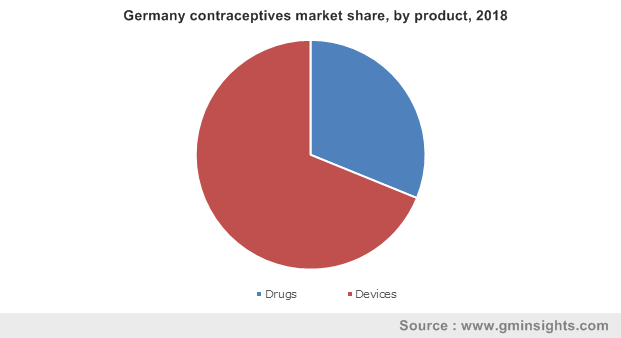 Germany contraceptives market is noticeably high compared to the other countries in Europe. Pills are the most popular choice as women are increasingly preferring user dependent forms over the long acting reversible contraceptives. Moreover, availability of sexual health services and a greater number of individuals availing these services to obtain contraceptives and related information will drive the regional revenue share. India contraceptives market will grow at 9.8% over the projection period owing to rising prevalence of STDs, increasing awareness campaigns to raise awareness about contraceptives and several government initiatives. Favourable family planning policy along with other reimbursement policies such as the AIDS care policy will positively impact business revenue. Some of the major players in market are Pfizer, Teva Pharmaceutical Industries, Merck & Co., and Mayer Laboratories. Increased R&D expenditure will offer innovative and efficient products. Other market players Reckitt Benckiser, Cooper Surgical, Church & Dwight Co., and Actavis continuously strive to fortify their market position through investments in R&D for developing new products, agreements, expansion of manufacturing facilities and business collaborations. Increasing availability of improved drug prescription for individuals, offering safety towards infection and pregnancy, associated factors of pill like decreased risk for cancer will boost the product demand. Technologically advanced product like topical contraceptive, a patch applied to clean, dry skin that releases hormones through the skin will propel the business growth. Contraceptive implants like Implanon is effective for three years and record no pregnancies among the first 70,000 cycles of Implanon users. Other devices like long-acting reversible contraceptives (LARC), intrauterine devices (IUDs) and hormonal implants offer lower infection and unintended pregnancy rate is anticipated to significantly improve control methods.